Wow! Our popularity is overwhelming us! The season hadn't started yet and we are busy. We joined up with Shakopee Brewhall in February to do pairings of Girl Scout cookies with their beers and our sodas. We start providing soda to the Boathouse Brothers Brewing (in Prior Lake) when they opened in April. 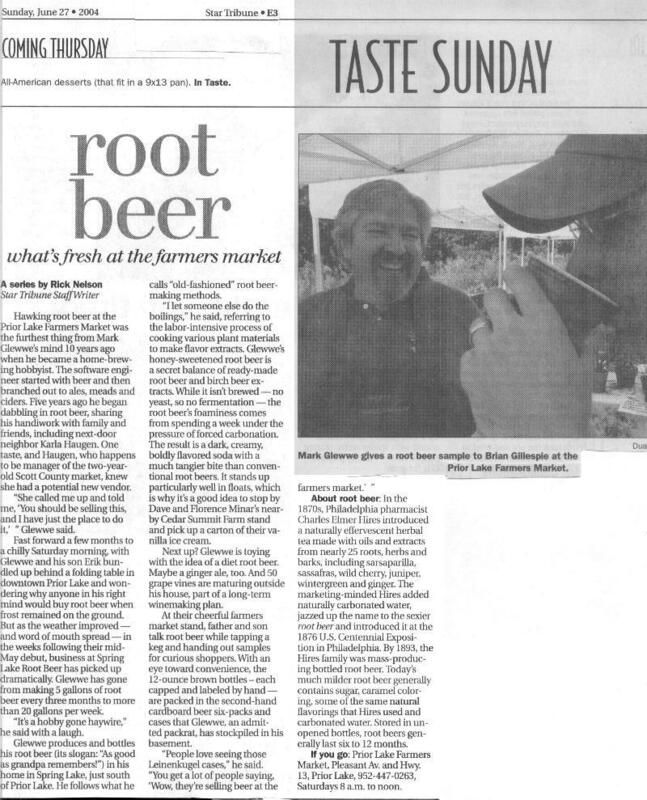 The Growler magazine published an on-line article in March on root beer in Minnesota and we were a part of the story. And in early June, the local Celebrate Prior Lake marketing wrote a nice article about us. And in the December, Roets Brewery in Jordan started carrying our sodas. And Shakopee Brewhall in Shakopee started back carrying our sodas again - Thank you!. This year we were invited to participate in the All Pints North beer tasting event in Duluth. Luckily, we had some of our Swiss family available to help. Thanks Patrick, Katlyn, and Andrew (this year's summer slave). And this autumn, we started providing root beer and cream soda to the Shakopee Brewhall for the folks looking to sip on a non-alcoholic beverage. Just before the start of the summer season this year, the local Prior Lake American newspaper ran a section of local businesses in Scott County. And guess who was included? Take a look. The facts are a bit off, but that is the price you pay for the freedom of the press. And this summer, we are expanding our summer open house events to include themed pot-luck food as well as music. And as we end the typical summer market season, Root Beer Trackers promised to provide a review but we are still waiting. And we are now participating in the Prior Lake Farmers Winter Market this year. We started off with another stellar review by Eric's Gourmet Root Beer in February 2012. And in April, the Eden Prairie Red Hat Ladies are coming out for a tour - and the markets don't even open for another month. soon became our International Relations Consultant (and he has business cards to prove it). and washed a lot of bottles. There is a bit more about Samuel's visit in our annual Christmas "year in review". Thank you for making him feel welcome. welcoming back Celtic Cat and Prairie Dog to entertain at our August Open House. Spirit of Brandjen Farm Autumn Boutique, Wilds Country Club Holiday Boutique, and others. See our Events for 2010. And we were mentioned in the Twin Cities Edible magazine, too. In May 2009, the Minneapolis StarTribune included us in fun things to do in the summer of 2009. They think we "did it right". In September 2009, we discovered we had a fan site on Facebook. Also in September, we provided root beer for the Crofut Family Winery Grape Stomp. On September 26, 2009, the 11th annual Scott County City to Country Tour, in collaboration with the University of Minnesota Extention, invited lots of folks to come visit our brewery. Then we learned we have cracked into national recognition!! Modern Marvels, on the History Channel, did an episode on soft drinks (sorry, the History Channel won't let you view it without paying anymore). We did not get a direct reference, but notice the background bottles, especially when talking to Anthony. I counted our bottle at least 4 times - and usually front and center. Wahoo! Thanks Sarah for pointing it out to us. In January 2008, Anthony's Root Beer Barrel web site rated our root beer. We did quite well. Thank you to Anthony and all of our loyal supporters. we were included in its review of Minnesota-made root beers. We were ranked the "most flavorful ... and well worth the trip to Prior Lake". wrote a nice article about us in a weekly series he was doing on the farmers markets of the Twin Cities. did an early morning radio interview broadcast live at 5:40 am.